It used to be that, when you wanted a gaming PC, there always had to be some kind of compromise. In most cases, it was the cost and the size. In order to pack power into a computer, manufacturers had to build massive cases to house the hardware. While things are still similar now, there are exceptions. The Trident 3 Arctic by MSI is a small and powerful PC, designed to fit in the smallest of spaces. Rather than looking like a traditional desktop, it instead, looks more like a gaming console. But can this small PC offer enough power when it comes to gaming and other tasks? Let's find out. Size & Weight 13.63"x 2.83"x 9.15"
Unlike most PCs that are large and muted, the MSI Trident 3 Arctic strives to achieve quite the opposite with its small size and bright white color. Now, looks will always be subjective, but in my personal opinion, I think it looks good. The sharp lines and shape give it a design that is unique and interesting. To add a tiny bit of flair, MSI has also included an RGB light on the front corner. While MSI does state on its website that it is customizable, I wasn't able to find software to control it within Windows or in the BIOS. This PC can be orientated horizontally and also vertically with the included stand. Unfortunately, this demo unit did not have the stand, so I could not test how it would look, but I think it can be imagined. Despite its small size, the Trident 3 Arctic still has plenty of ports, with headphone and microphone jacks in the front, along with a USB Type C, two full-size USB 3.1 ports, and an HDMI port. 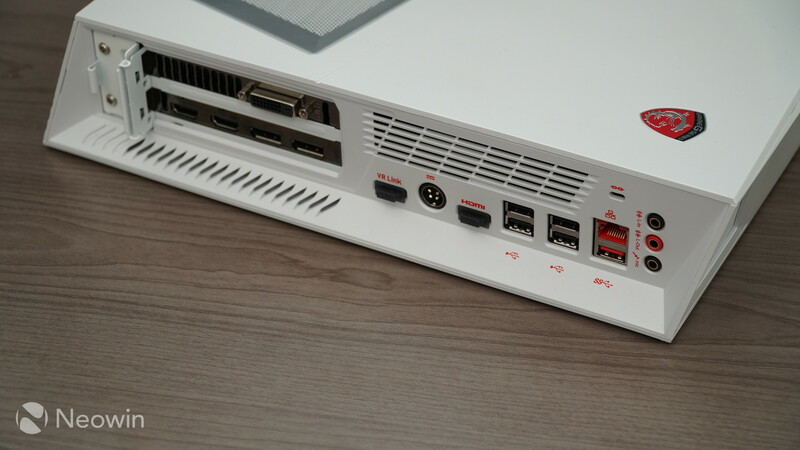 The rear offers four USB 2.0 ports, an HDMI for VR, HDMI out, and a USB 3.1 port. In order to keep things slim, there isn't a power supply inside the actual casing and the computer relies on an external 330W power brick. On the top portion of the PC, there is a ventilation grill that is positioned directly above the graphics card. There are also perforations on the sides that allow air to be carried into the case. Despite its compact size, the Trident 3 Arctic packs quite a punch when it comes to performance thanks to its combination of internals that include an Intel i7-7700 processor, 16GB of RAM, and a GTX 1070 graphics card. 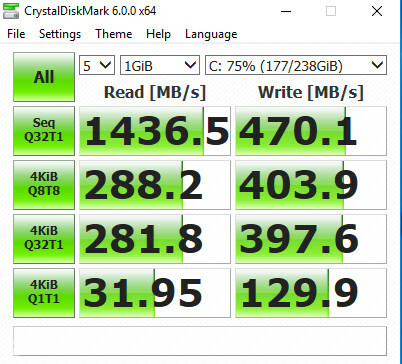 As far as storage is concerned, it has two different drives: a 256GB M.2 SATA SSD, paired with a larger 1TB 7200RPM HDD. 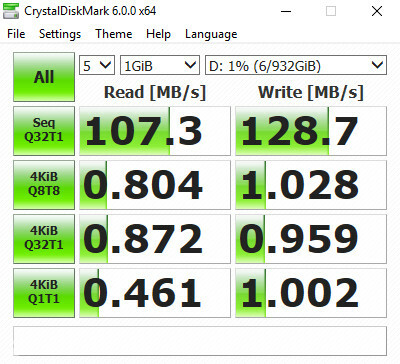 Using CrystalDisk Mark, the SSD was able to push a read speed of 1436MB / second, and could write at 470MB / second. As you might expect, the HDD was a quite a bit slower, clocking in read speeds of 107MB / second, and a write speed of 128MB / second. Despite this, there was never a time during use when things felt slow, and the second drive is perfect for storage. When it comes to gaming, things are also fairly smooth, as the unit is able to push over 100 frames per second with max settings at 1080p in titles such as Battlefield 1 and Titanfall 2. 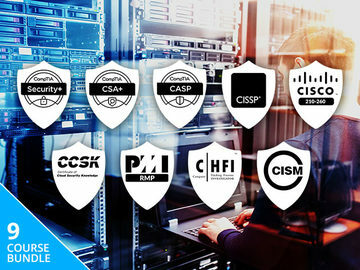 Other titles tested performed similarly. What was most surprising is that during the moments when the computer was being pushed to its limits, the sound of the fans weren't overwhelming. At its base, the unit's fans stayed at around 42dB, which is actually pretty quiet. When loading up 3DMark for benchmark testing, which drives the graphics card and processor a bit harder, the reading jumped up to around the mid 60dB mark, peaking at 65dB. Although this sound level is listed as the equivalent of a low conversation when in a small room, it is honestly not very noticeable unless things are dead quiet. Despite there being some initial issues with cooling during the first few hours of use, causing the computer to reach the high 80s and sometimes hitting 90 degrees Celsius, it has been working well for the past week, staying in the mid-50s when idle, and never peaking above 80. Unfortunately, for those that want to know just how well this machine can edit video, I did not have proper editing software to test this, but did run Cinebench to see some numbers. 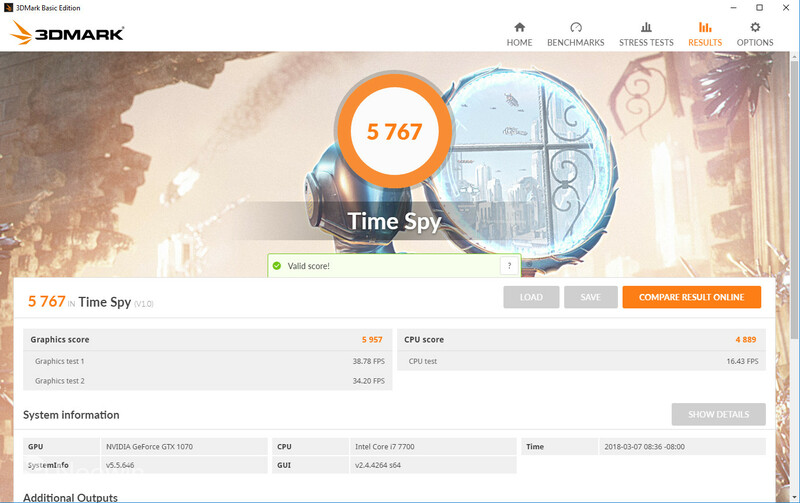 In its OpenGL test, the Trident 3 Arctic scored 123.11 fps, and the CPU value had a Cinebench score of 798. 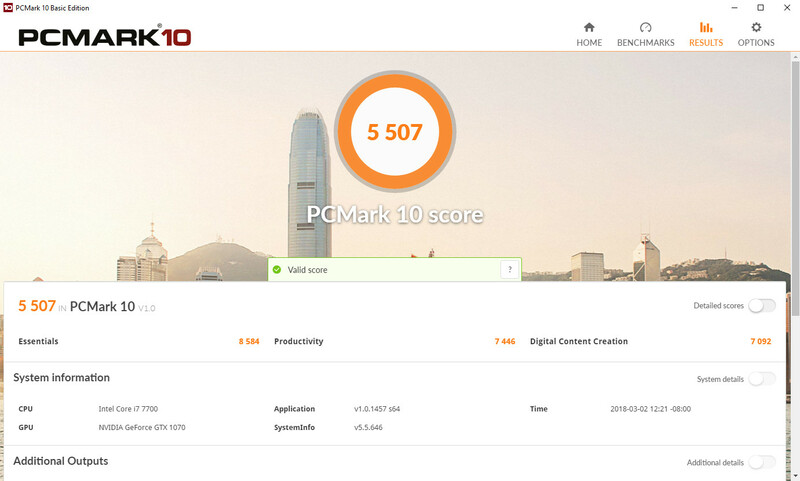 Using Geekbench 4, the PC was able to produce a single-core score of 4994, a multi-core score of 16,750, and an OpenCL score of 163,841. As you can probably guess, this unit will be able to handle most of what you would throw at it and do so without raging in a fit by blowing its fans and making noises that sound similar to jet engines. 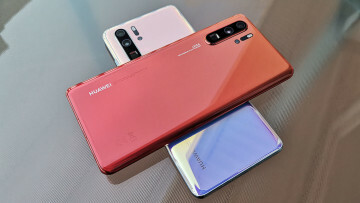 As a final note, there wasn't anything special when it came to the operating system, running a plain version of Windows 10 Home, devoid of any custom MSI software. There is no doubt that the Trident 3 Arctic is a powerful machine. But when it comes to the accessories like the keyboard and mouse, things are lacking. The PC comes with the MSI Interceptor DS4200 gaming keyboard and an Interceptor DS B1 gaming mouse. While on first appearance both look quite vicious and aggressive, in reality, they are quite mild. 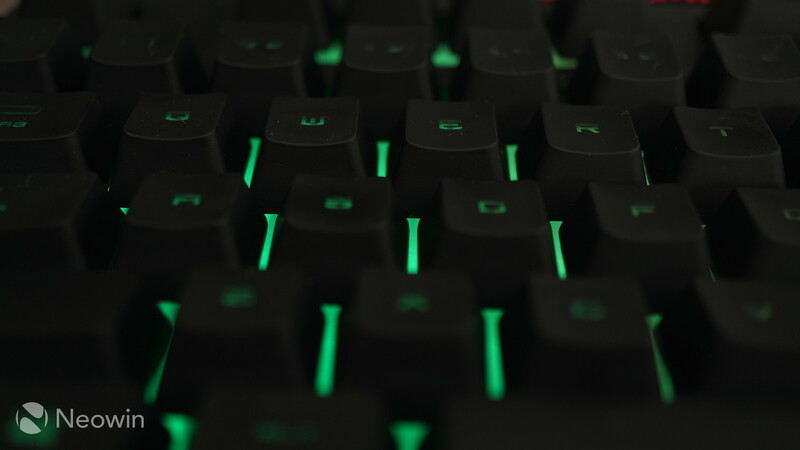 The Interceptor DS4200 is a gaming keyboard with membrane switches that are meant to give users a mechanical feel. It is liquid resistant, just in case you might spill anything on it, and also has RGB lighting that is not customizable. The keyboard does have media control keys that can control audio volume and also playback functions. 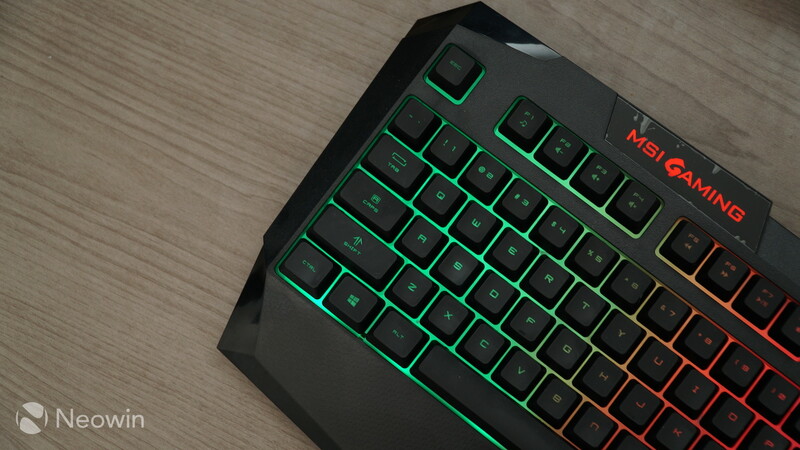 As you might expect from a gaming keyboard, it does have anti-ghosting capabilities up to 20 keys. There is also a palm rest, it is made from hard plastic and those with sensitive wrists might find it uncomfortable during extended use, but as for myself, this wasn't an issue. Lastly, there is a "gaming" mode key that will disable the Windows key so as to not accidentally interrupt gameplay. In all honesty, it's a bit surprising that MSI included this keyboard with the unit. 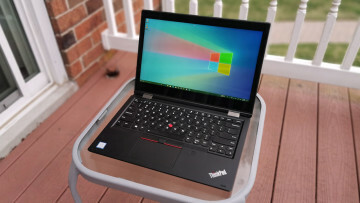 I mean, this is how users will experience a $1,499 computer and if the tactile feel is bad, it can be something that completely taints the experience. 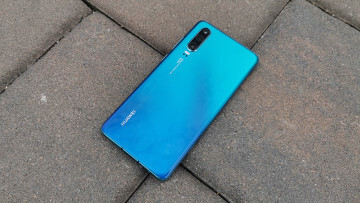 This isn't the best keyboard to be honest and it makes you think that something better would be bundled, but to be fair it isn't the absolute worst. The keyboard works how you might expect it, but does feel a bit mushy when pressing the keys and the depth of travel is vast. If there is one major complaint, it would be the font used on the keys. If you look at it from a top-down perspective, things look ok, but from an angle, the keys become very difficult to read. During my use, this became an issue several times when trying to orientate the hands or press keys during intense moments of a game. As for the DS B1 gaming mouse, it carries an ergonomic right-handed design with two buttons where the thumb would rest. There is also a button in between the left and right click that can change the DPI on the fly and a scroll wheel that feels rubberized. 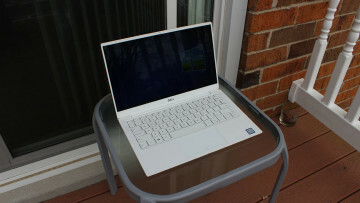 MSI states that it has an anti-slip surface but most of it just feels like plastic. 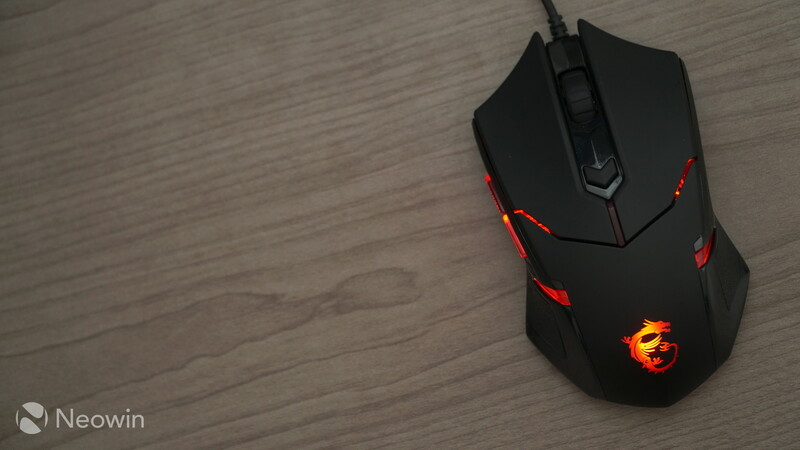 As far as customization goes, you will be able to change the weight of the mouse by adjusting the eight two-gram weights that are distributed towards the rear of the device. 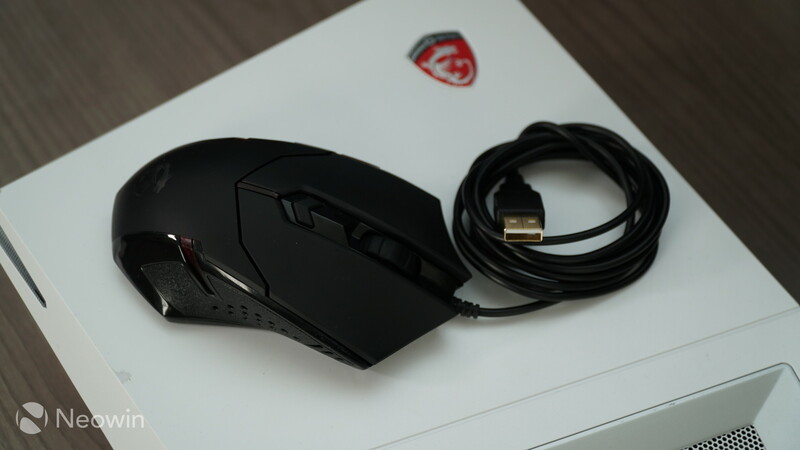 The mouse offers motion detection at 37ips, DPI up to 1,600, and frame rates up to 4,000. Again, it works, but it probably isn't the best solution if you are someone who takes gaming seriously. 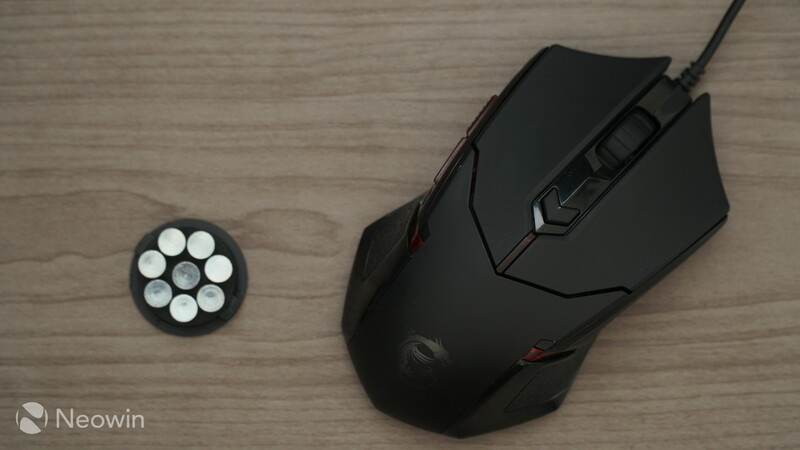 Luckily, as these are just peripherals, if you are so inclined, you can always invest a bit more and buy something to your liking or use a mouse and keyboard you already have. MSI's Trident 3 Arctic is a powerful machine, there is no doubt about that. 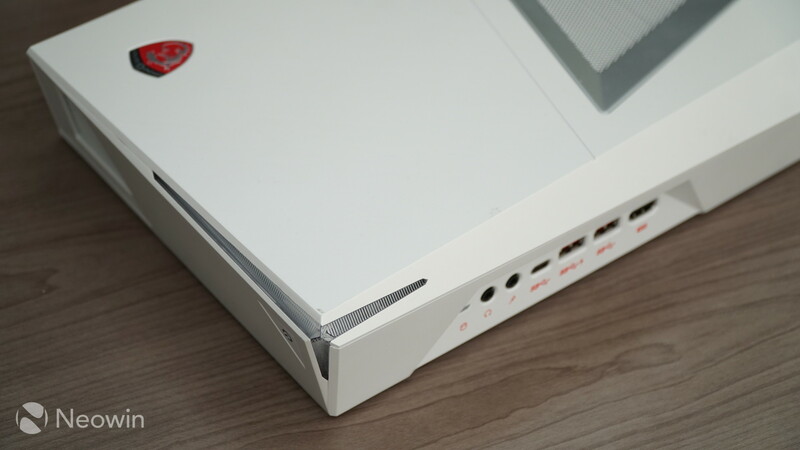 But as mentioned in the introduction, there are two compromises that come with owning a gaming PC and while the Trident 3 Arctic manages to be quite compact, its price is not. 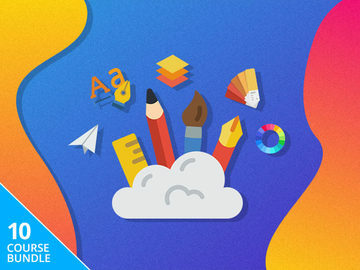 The $1,499 that you would spend isn't necessarily exorbitant,﻿ but is quite a bit to swallow when you consider that upgrading this unit will be a bit more limited when compared to a full-sized desktop equivalent. As someone who has always loved the idea of having immense power in a small compact form factor, the MSI Trident 3 Arctic is a joy to use. It could have a smaller AC adapter, making it more portable, but this is a small complaint. Also, while the keyboard/mouse combo are okay, I think MSI could have done better. If you are truly interested, it would be wise to wait for the 2018 model that was announced during CES 2018. The new model will arrive with the updated Intel 8th generation processor, along with a GTX 1080, but still comes in the same exact case.